Where have all the Catholic organists gone? 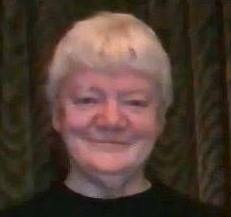 We had a visitor a few days ago, who casually remarked that the last three organists in her Church of Scotland church had been Catholics. That immediately added three to my ever-increasing tally of Catholic organists whom I personally know, or know of, who are now playing in the Church of Scotland. As far as I can tell, these musicians don’t abandon their religion. They make use of Vigil or Sunday afternoon Masses to fulfil their obligation. One or two even play at those Masses now and then, in addition to their official Church of Scotland commitment. But what is our Catholic Church about, that these gifted members of its flock feel they have to take their talents elsewhere? It’s easy to say that they are doing it for the money, but the situation is more complex than that. Certainly, for some the payment is the important thing, but these are usually people who need the money, students in particular. 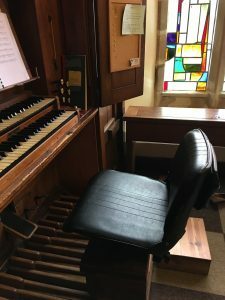 A more subtle attraction is perhaps the fact that organists are seriously valued in the Church of Scotland, where they have good, well-maintained instruments, responsive clergy and congregation, the chance to extend their skills with voluntaries and choral works, and a voice in the running of the worship. 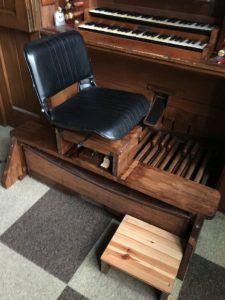 In contrast, Catholic parish organists can often find themselves stuck with aged, decrepit and inappropriate instruments, indifferent clergy and perhaps even some hostility from the congregation (he’s just a big show-off, playing that stuff as we go out!). There are notable exceptions, of course, such as my own church, but is it any wonder that some organists decide to escape? Professional playing in the Church of Scotland is not easy. The standard expected is high. Organists have contracts and can be sacked. The Catholic organists who make the transfer are therefore highly skilled and motivated musicians. Why should we have to lose these people? If our Church saw its organists as providing the essential basis of liturgical music, and valued them as such, it would invest in them. Not just payment, maybe not even payment. What we need is encouragement, resources, decent instruments and a modicum of appreciation. A little TLC could work wonders, and might bring back people whose real desire is to play good music in their own church. When will they ever learn …? Comments Off on Where have all the Catholic organists gone? We were halfway through the Litany of the Saints at the Easter Vigil when I realised I had omitted an important duty. The dreadful question loomed in my mind: Were the correct numbers on the hymn board? As soon as I could, I flipped my organ glasses to long-distance and with great trepidation looked at the board. Horrors! The Good Friday numbers were still there. Why, oh why, did I forget to check the board before things started? Stress, probably, at the end of an exhausting Holy Week. Still, it was my responsibility – mea maxima culpa – and what could be done about it now? At the Vigil the congregational hymns don’t really get going until Communion, so there was still a chance. I clambered out of my organ chair for a quick word with the altos. Could someone possibly change the numbers when the choir goes down to Communion? One of them pointed out that the box of numbers was not visible, so must be in the vestry. However, God bless them, two of them agreed to take it on, one to start fixing the board from the numbers already there, while the other would unobtrusively collect the box from the vestry. The hope was that all this would pass unnoticed in the general movement of people at Communion time. 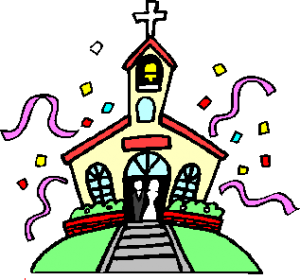 Anxiously I watched from the gallery, not wanting to start the Communion hymn (no. 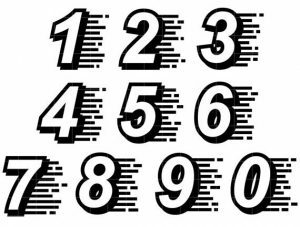 270) until the number appeared on the board, which had now become blank. Suddenly I recognised an arm in a blue sleeve which put up a 2 and then a 7. Where’s the zero? I thought. Of course, it must be in the box. Should I start? No sign of a zero yet – doubtless the second helper was still edging her box past the now enormous Communion queue. I started anyway, and when I looked up at the end of the first verse the numbers were all in place, and the choir returning in triumph. Very mournful hymns for the Easter Vigil, I must say. Oops! Just found it in the hymn book, and now the board’s gone blank. ‘Christ is alive’. Ah, now that’s better than Stabat Mater. Thank you, kind altos. Isn’t our choir wonderful! Comments Off on An Easter Crisis! 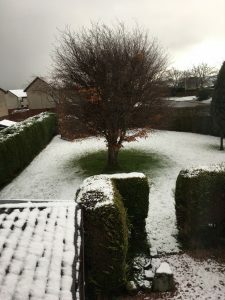 It is three days since either of the cars in our drive has moved. Our priest told me on the phone that two people made it to the weekday Mass that day (there are usually 40 or so), and that the big Tesco opposite the church had closed at 3 pm with empty shelves. A text has arrived from this week’s cantor, who went to London by train, to say that she can’t get a train back for Sunday. As for me, I’m not sure if I’ll even manage the two-mile drive over the hill. Ah well, a Mass without music is perfectly valid. But Holy Week will be a problem if we can’t practise. Especially as it will all be new to our stand-in conductor, the American lady from last week’s post. Time for a Plan B, I’m thinking. There’s certainly time to think of one when snowed in. 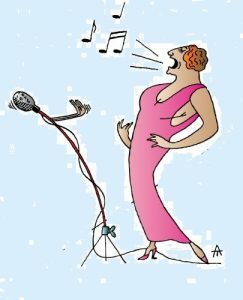 An alto (to stand-in choir leader from USA): Half-note? You mean a quaver? Stand-in leader: What’s a quaver? Me (to the alto): No, no, a half-note is a minim. A quaver is half a beat, if you’re working in crotchets, that is. Stand-in leader: What’s a crotchet? It’s all very well for me, of course. My favourite type-setting program is American, so I’m sort-of bilingual. But this very specialised culture clash came as a bit of a shock to everyone else. The American system is a sensible one, working down from the whole-note (semibreve) through half-note, quarter-note etc. 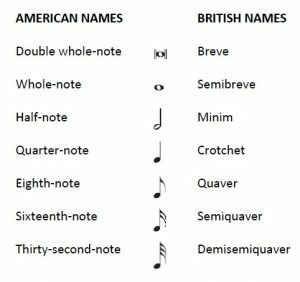 The British names are quaint and intriguing, especially breve, semibreve and minim, which date from medieval times, when they were considered very short notes indeed. (Longa and maxima, the old names for longer notes, have fallen into disuse. Not surprisingly, as today any one of them would last for ever!). I’ll give our stand-in leader a copy of the table below before the next practice. And as this learning exercise should be two-way, I’ll give out copies to the choir as well. Oh, and a measure (US) is a bar (UK). I couldn’t resist posting this list of what shouldn’t happen at the microphone! It was written by my very good friend, Frances Mary Dunlop, an experienced cantor who teaches upcoming cantors in her parish of St Mary’s, Greenock. Meet the Cantors from Hell! SADIE THE STYLE QUEEN always wears clicky heels so that she clatters around the altar like a geiger counter. The congregation are usually so mesmerised by her huge dangly earrings that they pay scant attention to the words of her psalm. The good cantor moves quietly, does not distract the congregation by idiosyncratic dress or mannerisms. CASUAL CLAUDE approaches the lectern pulling from his pocket a crumpled piece of paper from which he proceeds to sing the Word of God (Claude often acts as reader, usually at his cousin’s funeral). The good cantor uses a book or folder for a more professional appearance, and to show respect for the Liturgy. FRISKY FREDA is a young thing, fortunate not to have stiff knees. She runs briskly up and down the altar steps. The good cantor acts with decorum, moves unhurriedly, whether suffering from stiff knees or not! MESSY MARY is disorganised, spreads all her bits and pieces – books, papers, specs, glass of water – along the altar rails. The good cantor is well-organised, well-prepared, avoids clutter. The good cantor listens attentively to the Readings, participates in the Mass as a member of the Assembly. OPERATIC OLIVIA has had singing lessons, and doesn’t let anyone forget it! She bellows into the microphone the whole time, even when the people are singing their response. The good cantor engages in dialogue with the Assembly, does not sing while they are responding, knows how to lead without dominating. HASTY HARRY is anxious to save time. He and the reader (Hurried Hughie) start moving towards the lectern during the Opening Prayer. (‘No sense in making the Mass longer than need be.’) At the end of the First Reading he is treading on the reader’s heels, and beginning the psalm almost before the people finish saying ‘Thanks be to God’. The good cantor observes the principle that there should be no movement during a prayer, knows the difference between an ‘empty’ silence and the reflective silence which should follow the First Reading. The January bugs have been going around. Cantor rota is all over the place – it’s a question of finding out who is still capable of singing. Not so bad for organists. They don’t have to sing, and can snort, snuffle and cough in the gallery while playing. At least, I hope so, as I now have picked up something myself. Actually, there’s been no shouting – just an exhausted silence. Carol service and Christmas Mass seemed to go really well. Even our new anthem, which we had agonised over and which had a stinker of a pianistic accompaniment, simply labelled ‘Keyboard’, was without major incident. Choir and instrumentalists were all smiling and exchanging Christmas cards at the end. The church was the fullest I have seen for a long time. Congregation sang lustily, especially when it came to ‘O Holy Night’. When it was over singers and musicians all went home, no doubt for a well-deserved drink. Since then, there’s been no news. I haven’t seen any of the church people to find out how things were received. 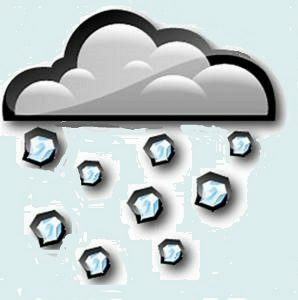 Everyone is celebrating at home, and the weather has been lousy – ice, snow and then a deluge of rain. Sunday 31st came sneaking along. No special music, just me in the gallery. 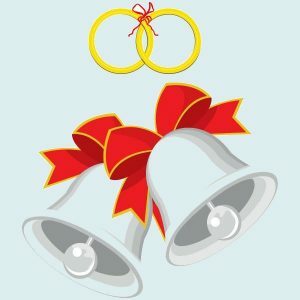 I asked our priest if he had had any feedback from Christmas Eve. ‘Oh it was very good.’ he said vaguely, adding ‘It always is’. Obviously his thoughts were on the days ahead, and with ice, snow and a funeral coming up, this was understandable. The cantor, when she came up for the quick run-through before Mass, was more forthcoming. Two of her relatives had been in the congregation. ‘They were still crying when I got downstairs’, she said. I felt myself go pale. Had it been that bad? But no, it turned out that they were just feeling emotional, carried away by the occasion. Phew! I thought. Maybe it was really quite good, if it had had that effect. ‘Oh, those two are always emotional’, continued the cantor, ‘Anything at all will set them off’.